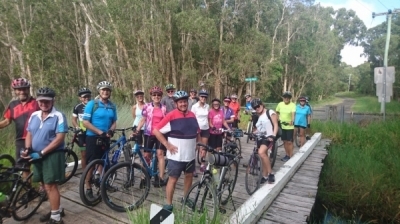 The Leisure Riders is ideally suited to people who have not cycled for a while and want an easy introduction to leisurely rides on bike paths and tracks around our coastal areas. Each trip is about 20km round trip, with a coffee stop usually half way, where we can have a chat and get to know each other. We leave from Jessica Pk, Nicklin Way, Minyama. 1. Make sure your bike is in good working order. 2. Pump the tyres to the right pressure (makes a huge difference). 3. Adjust the seat to your height. 4. Be fit and competent enough to ride the 20 kms. The main contact for this ride is David Friend (0408 558522). The exact start time varies with the seasons, so if in doubt please check with David.